A employee of the gas station / convenience store in Fairfax was shot and injured this (Friday) morning. At approximately 7:59 a.m., the Renville County Sheriff’s Office received a 911 call from a gas station / convenience store / auto repair shop in Fairfax, indicating a person inside the building had been shot. Subsequent information was received indicating that suspect, Michael J. Klatt, age 60, of Fairfax, had been disarmed. Upon arrival at the scene, responding officers immediately located and arrested Klatt, who was not an employee at the business. The victim, Kenneth M. Eckstein, age 55, of Hector, an employee of the business, had suffered a gunshot wound to the hand and face. He was treated at the scene for his injuries, and later flown to North Memorial Health in Robbinsdale. 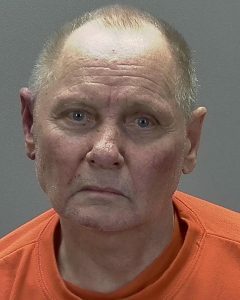 Eckstein was undergoing surgery and his condition was unknown at the time of the Renville County Sheriff’s Office press release at 3:30 p.m.
Klatt is being held in the Renville County Jail pending formal charges by the Renville County Attorney’s Office. He is expected to make his first appearance in Renville County District Court on Tuesday, January 15. Officers and deputies remained at the scene to continue their investigation. Agencies responding to the scene include the Renville County Sheriff’s Office, Fairfax Police Department, Minnesota State Patrol, Fairfax Fire and Ambulance, North Ambulance-Redwood Falls and North Air Care.